Previous Episode:My #1 Time Management Tip: Don't Multitask; Compartmentalize	More Episodes Next Episode:Up All Night to Get Lucky: Sonia's in a New Documentary! Once upon a time, combining relationship-building content with solid sales strategy was a weird idea. Now it’s pretty mainstream — but a lot of folks are still missing the underlying context that makes it work. Come hang out in October! If you want to join me and the Copyblogger crew for the live Digital Commerce Summit (Oct. 13-14) in Denver, get on over to the site today for the best price on tickets and extras. If you’re quick, you can get a whole year of our Digital Commerce Academy to go with it — which will give you a massive running start on getting the most out of the event. I’ve been doing lots of mindset and what some might call “woo,” so today I’m going shift gears and get into a key strategic underpinning that makes content marketing work. I wrote about this for Copyblogger 8 years ago, in a post called The Harpoon or the Net: What’s the Right Copy Approach for Your Prospects? 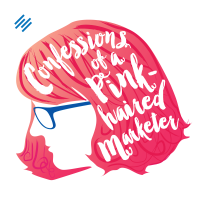 It recently came to mind because Jerod Morris and I were talking about marketing funnels and paid advertising, such as Facebook advertising, over on CopybloggerFM, the sister podcast to this one. And it occurred to me that the thing that makes paid advertising work in 2016 is the same thing that made content work way back in 2008. So let’s unpack it. Long, long ago — in other words, a few years ago — there were, for lack of better terms, “content people” — and Copyblogger was one of the very first to write about this approach, and then there were “paid traffic people,” which encompassed most of what then fell under the title Internet Marketing. Content people wrote interesting things and built an audience. Paid traffic people bought traffic, which was cheaper to do 8 years ago, and piped that traffic into a sales page with the intention of making a sale. Like all absolutes, there were exceptions. There were a few people who advocated doing both, but the content people often shied away from learning about how to pay for traffic and not get murdered financially, and the paid traffic people looked at the work involved in creating genuinely useful content and weren’t that excited by the prospect. In the words of S.E. Hinton, That was Then, This is Now. Believe it or not, I actually generated some controversy when I wrote a post called Is Your Tribe Holding You Down, talking, more or less, about these two groups of folks — the audience-focused types, who at that time were mainly bloggers, and the traffic-focused types. I feel bad today because some of the folks on the traffic-focused side apparently got their feelings quite hurt, when really I was poking a bit of fun at both sides. If you build a relationship but have no marketing strategy, you’ll be popular and broke. If you have killer marketing strategy but spend no time on relationships, you’ll tend to have big revenue spikes puncutated by very long periods of also being broke, because no one trusts you. So it’s not wise to be one one side or other of the spectrum, you want to learn from both. I speculated that maybe a new “tribe” could be formed that learned from both worlds, and folks started calling that The Third Tribe. We actually used to have a community with that name, which over time evolved into today’s Authority community. Hopefully my brothers — at that time, almost all of them were guys — on the Internet Marketing side can appreciate that. I have some very dear friends from that community and tradition, so I’m not slamming them, although I might poke a bit of fun at times. Back in the day, this notion of combining relationship-building content with smart selling strategy was actually a weird idea. Today it’s just how smart marketers do things, and the labels aren’t quite as limiting as they used to be. OK, enough history, let’s take a look at how it looks in the real world today. Unpacking this analogy, if you buy traffic and send it directly to a sales page, it’s what I call a harpoon. A well-written traditional sales page acts like a harpoon. When a likely prospect swims along, if the writer’s aim is good and she gets enough power behind that harpoon, she can make the sale. The main issue with that traditional sales page — if y0u’ve been online awhile, you might remember when they all had fake yellow highlighter and red headlines, it was not a high point in web design history. But the main issue is that this kind of page is crazy hard to write. Now it can be learned, and of course we can hire folks to write them for us. But the folks who are genuinely good at it are also genuinely expensive. In a world without infinite resources to learn something hard or pay for something expensive, we needed another model. This is what today we call “strategic content marketing.” We build an audience with our content, and that content builds trust over time. It also educates that potential customer on what they would need to know before making a purchase. This is wide territory — it might be a pragmatic thing that they need to believe. For example, folks may be reluctant to buy a WordPress theme if they don’t realize the dangers of putting all of their content on something like Facebook or Medium. To speak to that, I wrote a post on The Most Dangerous Threat to Your Online Business, about the danger of building all of your business content on a platform that someone else controls. It might be a process that they need to understand. When folks learn more about content marketing strategy from podcasts on our RainmakerFM network, or posts on Copyblogger or DigitalCommerce.com, they can see how they would use the Rainmaker platform to deliver that. People who don’t have at least some grasp of content strategy wouldn’t see the need for a platform that’s structured the way ours is. It might even be a more personal value or belief. Brian Clark wrote a great post about The Snowboard, the Subdural Hematoma, and the Secret of Life, about how a brain injury gave him clarity about what was important in his life — and the values that event revealed were values that either resonated or didn’t. I wrote one of my own (internally we sometimes call these “hematoma posts”) about struggling in the corporate world for being “naive” because I was an idealistic person and I thought that was a better way to do business. And you may have noticed that this podcast is really about me expressing my values as a human being who’s in business, hopefully to empower others to trust their own instincts and build on their strengths instead of getting discouraged. A final word about this “Content Net” idea — it sounds very nicey-nice and “if you build it they will come,” but it isn’t. Seriously interesting and useful content has to be paired with business strategy if you want it to work. Otherwise you just stay adrift in that “popular but broke” thing, which is maybe not where you want to be. Again, I’m not claiming I invented this or Copyblogger invented it, but I do believe that we have become known for this very ethical, principled approach, and we love to offer our platform to others who are teaching this approach. Content strategy isn’t “rocket surgery,” but it has a fair number of pieces and it’s important to know how they work together. There are a few resouces we can offer you to figure this out. The first one is 100% free, which is our content marketing library. Brian Clark and I, joined by a few other folks, have put together a comprehensive library of ebooks to give you that understanding. If you need a little more hand-holding and motivational fire, my best recommendation for 2016 is to join us at the Digital Commerce Summit. It’s happening in Denver in October. Right now, but this will expire soon, you can actually get the Summit ticket and a full year of our Digital Commerce Academy, which is a more advanced series of courses about how to do digital business. Pricing on that is going up on May 27, 2016, so boogie on over to DigitalCommerce.com if you think you want to join us there. I’m going to be doing a keynote on how to actually use the information that you learn at that conference, or any conference. The rest of the event is really a curriculum, so you learn how the different pieces go together — not only for your marketing but also for your actual product or service. We’re structuring it so that you start to take action to get to the next level from where you are now — before you even leave the event. It’s all oriented to action you can take right now, paired with the understanding of the larger strategy so you see how everything fits together. The conference is perfect for people who want to make something happen with a digital business — either a side project or something that could grow into quite a large business — but they’re having issues with overwhelm. They have some of it figured out but there are pieces that you’re finding intimidating or too confusing. Join me this coming Thursday on CopybloggerFM for an episode on how to put together opt-in bonuses to start the conversation with your audience.